In September 2007, a video allegedly of Osama Bin Laden was released in which Osama had a black beard. This video has been widely ridiculed since the man in the video seemed to look nothing like Osama. I have in my videos a number of times compared the 2004 Osama to the 2007 Osama to show the difference in appearance, and in my song included the line "give up all your rights and you'll be saved from the big bad bearded timelord in a cave", referencing the difference in appearance. Several 9/11 movies such as the final Loose Change movie and Zero also argue that the man is not Osama. But now some new videos have been released, and four of the new videos are basically the same as the 2007 footage but raw and in higher quality. 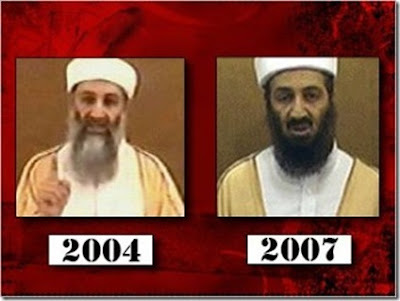 The man in these new videos is clearly Osama Bin Laden. So, since the footage is identical the 2007 video and the man in the videos is clearly Osama, we can therefore reason that the so-called 'Blackbeard Bin Laden' in the 2007 video probably was Bin Laden after all, and not some other guy with a fake black beard or something, as many have assumed.